Hemerocallis common name Day Lily are a spectacular summer flowering plant most of which are herbaceous and vary in size from small compact varieties of around 30cms to the taller varieties of up to 1.5m. Hemerocallis have very beautiful flower heads, often with stripes and striking markings, the first image which is H. 'Night Whispers' and they have attractive clump forming foliage. Hemerocallis are long flowering, perhaps 4-6 weeks, although each flower may be short lived; the name Hemerocallis means 'beautiful for a day'. Many Day lilies are herbaceous which means they die back totally in the winter leaving just bare earth, and emerge in the spring with new growth. In some milder areas they can be evergreen or semi-evergreen. In terms of effort, growing day lilies (Hemerocallis) does require some effort and so are marked as an amber wheelbarrow plant. Hemerocallis are easy to grow in terms of being unfussy about the soil and their only real requirement is sun to encourage flowering, but they do need some maintenance so are not trouble free . The effort side is that Day Lilies need attention in the growing season, the main tasks being to stake the plant and regular dead heading. The new growth may look very upright as it emerges, but don't be fooled, day lilies look much better with some staking and support. This means in spring, as the growth emerges, place a support under their foliage to keep the plant upright and stop it collapsing later in the season when there are many blooms. Day Lilies are also high maintenance because they need to be dead headed regularly to keep the plant looking good. Each stem has multiple flowers, which is good in the sense of making the plant attractive, but it also means a lot of dead heading as the flowers are short lived they need to be removed regularly to keep the plant in good shape. After flowering each stem can be cut to the ground. Once the plant has flowered and the foliage looks tatty, cut the foliage to the ground and it will reward you with fresh lush growth for the rest of the summer, although it will not flower again. The plus side is that day lilies flower constantly from late spring to early summer, with strong lush foliage and make excellent border plants. They form large clumps, see third image above, and produce good strong colour. They look spectacular producing large trumpet shaped flowers in varying shades of yellow, orange red and deepening down to crimson. Day lilies are an amber wheelbarrow plant as they do need some attention and division with time, so not entirely maintenance free. One point about growing day lilies is that every three years the plants need to be divided as they become congested. This means you have to dig up the plant, divide and replant. If you have day lilies which don't seem to be flowering as well as they did, this could be the problem. 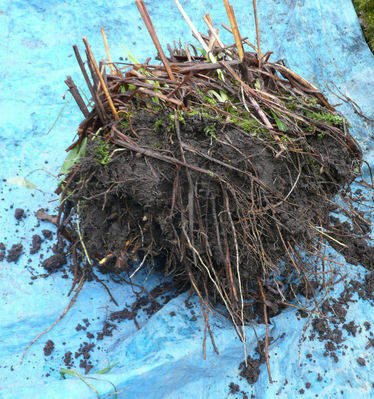 The image shows the congested clump of day lily which has been dug up and place on a tarpaulin ready for division. The best way is to take a small saw to the clump and cut it into pieces and re plant, all of which is quite hard work. The time to divide is late autumn or spring. If the plant has flowers which fail to open that can be the work of the Hemerocallis gall midge which is tricky to get rid off, the best way is to pick off the affected flower heads and do not compost them. H. 'Marion Vaughn' lemon-yellow and 'Whichford' both are scented. H. 'Pink Charm' has a starry shape and a salmon tinge. H.'Gentle Shepherd' is pale pink second and enter image. H.'Stafford' is a striking red with yellow throat. H. 'Elegant Candy Pretty' pink Hemerocallis with red eye and edge over green throat, and fragrant. H 'Moonlit Masquerade' very unusual cream with dark purple. There are dozens of varieties of Hemerocallis simple to grow in a good sunny spot.